To call India’s performance in the first test against South Africa a disaster would be an understatement. That’s how bad it was. India entered this series as number 1 side in the world, but judging by what transpired over the 5 days in Centurion, the team looked far from being the best side in the world. I agree that losing the toss on the first day was a recipe for disaster but it wasn’t a 136 all out pitch for sure. The pitch had some bounce and SA bowlers were exploiting it quite well but a batting unit as experienced as India is expected to counter them. The Indian batting looked clueless and except for Sachin Tendulkar, Dhoni and Harbajan looked ordinary. The first innings batting collapse meant that India needed to show some fight with the ball and try to restrict South Africa to a reasonable first innings total but it was not to be. The bowling was very poor to say the least, never looked like taking any wickets on a pitch which eased out a little bit. The fast bowlers were unable to provide the initial breakthrough and it was too much to expect Harbajan to get the wickets on a flat second day pitch. Even though the pitch was flat, the bowlers still had some bounce to work with, but the Indian bowlers looked listless. The problem for Dhoni was that not only his bowlers were ineffective but the runs were coming at a fair clip for the South Africans. The South African batsmen were scoring at almost 5 runs per over which meant that they could declare sooner than the Indians would have wanted them to. The only reason the Indians managed to pick up couple of wickets at the end was due to the fact that the home team was throwing their bats around for quick runs. It was a great game for Kallis as he scored his first double ton in test cricket and De Villiers scored fastest test hundred for South Africa. Once South Africa took a 484 run first innings lead, the Indians were just hoping for a miracle. The batting in the second innings though showed some fight as the top order finally came to the party. Sachin Tendulkar once again showed why he is a class apart from his team mates as he looked comfortable against a confident bowling attack and scored his 50th test century. It was brilliant innings under pressure as he tried his best to save the test for his team. Dhoni, Sehwag, Ghambir and Dravid batted well too, but the lead was too much for them to overcome. As loss by an innings will be a bitter pill to swallow for the Indian team. So what can the team do to reverse the trend? First things first Zaheer has to be back in the team. His experience and skill will add much needed potency to the pace attack. With Zaheer being fit and available, that should be taken care of for the second test. The second most important thing would be getting Pujara in the place of Raina. Raina unfortunately does not look cutout for test cricket but Pujara does. I think the experiment with Raina in the middle order should end. When Harbajan Singh can bat better than your designated number 6 then for sure the team has an issue with that position in the order. So that change has to happen immediately. With just few more days left for the second test to commence, the Indian team does not have too much time to regroup. I don’t think they can drastically improve from what we say few days back in Centurion. The only silver lining for the team is the fight the batting put up in the second innings but the concern with the bowling will still remain. I hope that the bowlers put up a better performance at Durban to give India a better chance of coming back into the series. It will be for sure an interesting thing to see, how the team responds to the loss in the first test. As the best side in the world they have a point to prove and another loss will only raise further doubts regarding the current rankings. We are just a week away from India’s first test against South Africa at Centurion and Dhoni is about to face his biggest challenge as a captain. Since he took over as the Indian skipper in 2008, he has been only on three overseas tours and two of them have been in the subcontinent. Whatever the world says, Dhoni does have an impressive resume as a captain. He hasn’t lost a test series and has lost very few games as a captain of the Indian team. India does not have any practice game ahead of the first test which is a worry but the BCCI did the right thing by sending the test specialists ahead of the schedule to get the feel of the conditions. The Indian coach Gary Kirsten and the bowling coach Eric Simmons being South Africans might be the trump cards India need. Their combined knowledge of the conditions there might help the Indian bowlers and the batsmen to prepare for the South African challenge. So does India realistically have a chance to topple South Africa in their home turf? I think they do. When India visited South Africa in 2006 they were expected to be rolled over and after a 4-0 drubbing in the ODI series it did not seem otherwise. India on the contrary rolled over the hosts in the first test and South Africa had to dig deep to come out of that hole. South Africa finally won the series 2-1 and if not for the poor batting on the 4th day of the final test, the result would have been otherwise. That series showed that India can compete on those pitches and looking at the current team they can in fact do more than just compete this time. The biggest advantage for the visitors this time is their pace attack. In 2006 it was just Zaheer and Sreesanth, the third pace option (VRV Singh) wasn’t that effective which was a huge setback with the lack of all round option in the team. This time though we have three in form pacers in the squad, Sreesanth and Zaheer are back with Ishant as the third seamer. If the tracks are pace friendly these three can trouble any batting team. Ishant bowling brilliantly against New Zealand in the third test should give the Indian team management loads of confidence ahead of the much important series. The biggest worry for Dhoni though will be the spinners. Harbajan’s form with the ball will be a huge worry for the team management and he bowling well in tandem with the pacers for me will decide the series. I am not sure if Ojha will get any chances in the series but he did not look that threatening either in the home series against the Kiwis. Even though the SA series is all about the fast men, spinners are equally important as well to keep the pressure up. The Indian batting though hasn’t changed that much since the 2006 tour. The core of the team still remains with Sehwag, Sachin, Laxman and Dravid still in the team with the welcome additions of Ghambir and Raina/Pujara. The Ghambir/Sehwag opening combination will be very important for the team against the South African new ball pair of Steyn and Morkel. I am not sure who their third pacer would be but the new ball bowlers from the home team will attack the Indian openers. India has loads of experience at 3, 4 and 5 followed by the edgy Raina at number 6. Sourav Ganguly did a brilliant job at number 6 in India’s previous tour and after his retirement the team management has failed to find an able replacement for that spot. After trying Yuvraj unsuccessfully for few games, the management has now kept faith on young Suresh Raina. They probably expect his enormous ODI experience to finally show through in tests as well. Raina though had a disastrous home series against New Zealand and his frailty against the short pitched stuff will surely be exploited by the South African fast bowlers. He needs to figure out a way to counter the barrage. If he fails to do so, I am thinking that Dhoni has to seriously consider replacing him with much more technically sound Pujara. The other important batting spot will be the captain himself at number 7. He needs to shed his poor form and perform consistently for the team with the bat at that position and of course his leadership on the field will be very important. The Indians will be entering this series as the best side in the world and a win would give them tremendous boost and confidence. Dhoni and Kirsten will be aware that in case of a slip up, their rankings will be questioned again. They are playing a team who are second in the rankings and have been fantastic over a sustained period of time. They are a hard team to beat anywhere, especially at home. Their pace attack will be a threat and their batting led by Amla and Kallis will be hard to dislodge. The Indians will be very much aware that they will face much sterner test of character than the just concluded home series against the Kiwis. Dhoni I guess has all the ammunitions this time to turn this series onto a memorable one for the Indians. If they manage to win the series they will for sure be undisputed number 1 team in the world and I hope that Dhoni and his men put up a great performance in this series. Since I have not posted for a while I decided to compile all the happenings in the sports world in a single post. I have decided to split this into two parts. The Indian team cut a sorry figure in the recently concluded World T20 as they were bounced out yet again two years in a row in the super 8 stage of the championship. This year was an exact replica of the 2009 edition in England where the Indian team failed to win a single game in the second stage of the tournament. The batsmen looked sitting ducks against the pace of the Australian and West Indian bowlers and handed the games without a fight. The performance of the Indian batsmen was baffling to say the least as they very well knew what to expect after their experiance in England last year. Raina, Sharma, Pathan and Ghambir struggled last year in England against short pitched stuff and they repeated the dose once again in West Indies. The bowling was bad a usual as except for Harbajan Singh everyone else was either unfit or inconsistent. The team selections were confusing and the fielding appalling. This year’s exit was made even worse when the team coach lashed out against few players calling them unfit to play any form of cricket. The coach Gary Kirsten even said that he was fitter than few players in the Indian team at 42. And there was also a report of few players engaging in a pub brawl after their defeat against Sri Lanka. All in all it was another pathetic ICC World event for India under Dhoni. The silver lining though is that India has chosen a young team under Raina to participate in the tri series in Zimbabwe and I hope that we unearth some good players in that series. Armaan Ebrahim finished 6th in both the races in Morocco to cap off a brilliant race in the 3rd and 4th rounds of Formula two championship. Armaan’s top 6 finishes was despite the fact that he did not do that well in the qualifying as he finished at 8th and 11th respectively. With a brilliant performance in the Morocco leg of the championship he currently sits at 7th in the overall championship race. 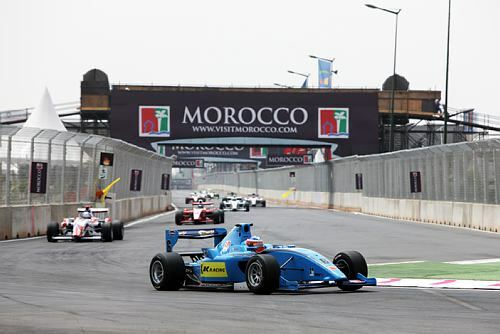 Ajith Kumar also had a good race in Morocco as he finished identical 13th in both the races. Ajith would be really happy with this performance as he was able to finish 4 races in a row and would like to improve on his standings in the upcoming races starting with Monza on the 23rd of May. Parthiva Sureshwaran though had a mixed round 3 and 4 as he finished 11th in the first race and had to retire in the race 2. All in all it was a good performance from the Indian contingent and it seems like we are not that far away from a podium finish. Please visit Formulatwo.com for the latest updates on the Monza race. India is almost out of the champions Trophy and barring a miracle, they will pack their bags and head home tomorrow. As I wrote earlier India’s bowling problem hurt their chances in the Champions Trophy. The Indian bowlers were pathetic against Pakistan in their first game allowed them to escape from a precarious 65/3 to 302 which in the end proved too much for the depleted Indian batting lineup. This has been the problem with the Indian team for the past 1 year or so. The batting strength was able to shield this weakness but with the absence of couple of key players it was exposed even further against the Pakistanis in the Champions Trophy. So the perennial question is where are the bowlers? So much of domestic cricket being played, so much of talent but why do we keep hearing the same names again and again? Are the selectors good at actually tapping good talent? India has loads of talent in the Domestic arena but has been reluctant to try out new players in the National squad. Three years back when Guru Greg was at the helm there was a bowler named Abid Nabi who was touted as the next big thing in Indian cricket. He was even summoned to bowl at the Indian batters in the nets but where is he now? He signed up for the ICL and could not be considered but still his name was never mentioned during selection anytime. He is now in the list of players who has accepted the BCCI “Amnesty” program. Another one of BCCI’s ridiculous act but at least he can be in contention now. And then there is Sudeep Tyagi who has been performing very well in the domestic cricket, had a good IPL and also performed brilliantly in the recently concluded Emerging Players trophy in Australia but he is nowhere close to selection. The Indian selectors are known to waste talent in domestic cricket for ages now and it has hurt Indian cricket. There are loads of names which come to mind. Where is Piyush chawla, Pujara? Both have been performing consistently in the domestic arena. Chawla though has done quite well when he has been given chances at the National level but still continues to be ignored by the selectors. The Indian selectors are short sighted which is the major problem. They always look to fix the current issues but fail to look at the larger picture. When we speak of All rounders, it always has to be the Pathan brothers but what about Ravichandran Ashwin who has been brilliant for Tamil Nadu? Ashwin has been brilliant for TN and could be an asset in the Indian team but has never been in consideration. The Indian team needs to find some good bowlers to complement Zaheer and unless they do that we cannot claim ourselves as the contenders for the Number 1 spot. Ishant Sharma needs a break to sort himself out and if possible needs to take a break from the IPL to concentrate on his bowling. India has the talent to develop into one of the best teams in the world even after the retirement of the greats but the selectors need to be smart about this. Grooming and nurturing young talent is really important and unless that happens, Indian cricket will continue to suffer. Right talent needs to be encouraged irrespective of where they come from. Players like Ashwin, Nabi, Pujara, Tyagi, Chawla, Mishra, Kohli, Badri, Vijay etc have to be in the Indian plans for the future and need to be given chances regularly to prove their worth. India play a 7 match ODI series against the Australians and it will be the right time to rest some bowlers and give chances to youngsters. They cannot perform worse than the current pack. Keep Ashish Nehra and change the rest of the bowling, RP Singh, Ishant and Harbajan need a break and have to be challenged. They have been performing badly for about a year now without being shown the door in ODI cricket and need to be given a break. If India needs to be considered as the number 1 team in the world they have to work towards it. I hope that Dhoni and the selectors are listening. Now that T20 WC is done and dusted, it’s time for India to fly down to the Caribbean for a 4 match ODI series. The team announced is sans Sachin, Sehwag, Zaheer and Pathan and is quite an inexperienced one. Ashish Nehra gets a call back to the Indian team due to his fine performances in the IPL and Abhishek Nayyar is the only new face in the squad. The Indian team will directly fly over to the WI from London on the 21st. It will be a different experience for Dhoni who has hardly put a foot wrong during his tenure as a captain of the national side. The failure in the T20 WC is going to hurt for sure but calls to drop him is little premature I think. Dhoni is an excellent leader and India is still the third best team in 50 over and Test formats. Even though the team is less on confidence we should beat the WI even with this depleted team. The bowling will be spearheaded by Ishant and Harbajan and the batting by Dhoni and Yuvi. Ghambir I guess will do fine in the 50 over format as he was in reasonable form in the T20 WC. Rohit Sharma also will be a key player in the team. Dropping Irfan Pathan was a bad decision I feel as he is the only other player to have toured WI before. Nehra has been there too and so has Harbajan, so the Indian bowling will do fine but it’s the batting which will be a major worry for the Indians. 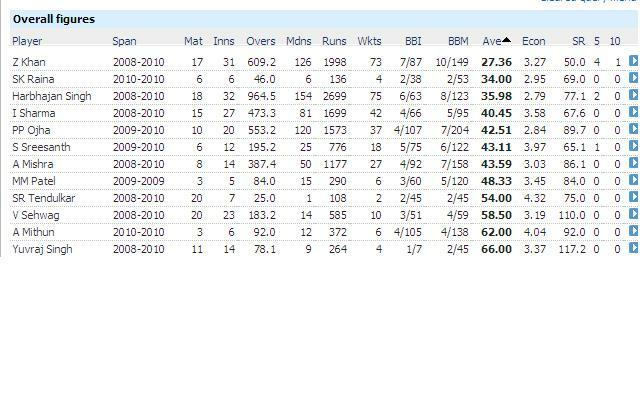 Irfan could have solved that issue coming in at no 7 as he is a very good bat and a decent bowler at the start. In the absence of Zaheer, he would have been a good bowler to have in the squad. I hope that the experiment with Rohit opening the bat will end after the T20 WC and someone like Vijay can join Ghambir at the top. Rohit can come at number 4 and Raina can bat at number 3. The Indian captain though would want to come back to his aggressive best. It will be a test of character for the Indian captain as this will show how well he can handle the pressure. Winning this series will be of utmost importance for the team as this will also propel us closer to the top spot in the ODI rankings. In a way it’s a good thing that India isn’t flying back home after the T20 debacle but on the flip side, watching the other teams battling for the title cannot be good either. Anyways this series will be an important one for the Indians and I hope that we win. The team has been great over the past one year or so and I hope that we bounce back the same way we did after the 2007 WC. 41 years of wait finally ended as India completed 1-0 series win in New Zealand. This win will be particularly sweet for the seniors in the team as they have been on the receiving end on more than one occasion. It was a fantastic performance by the Indian team and was a total team effort. I was little bit disappointed that we were unable to close out the 3rd test and win the series by 2-0 margin. When the rain halted the proceedings on day 5 with New Zealand on 284/8 the only thing which came on every Indian supporter’s mind was If only we had 10 more overs. If we look back at the 4th day’s play India batted too long I thought. We should have probably given NZ a target of 550-575. I don’t think that the Kiwis would have had a realistic chance of scaling that score against the Indian bowling attack. Anyways that’s just in the hindsight. Nothing should be taken away though from the team as they have completed another major victory. They just have two more mountains to climb, Australia and South Africa. If they can achieve this while Sachin, Dravid and Laxman are still in the team it will be really great. Yeah there is one more location India hasn’t won that often which is Sri Lanka. Twice in last ten years we lost the series after going in to the final test with 1-1 score line. For India to win in Australia and SA they have to improve their fielding and catching as this let them down badly in New Zealand. If Ishant hadn’t spilled a sitter of Ian O’ Brian of Sachin India probably would have won 2-0. So that’s one area which we have to work on. The second area of concern is the third seamer. I would prefer Sreesanth to come into the squad in the place of Munaf. Munaf is a good bowler but sometimes he looks lifeless on the field. I am not even talking about his bowling but just his body language which sometimes is not that encouraging. Well overall this has been a fantastic series for the Indians. Winning the one-day series 3-1 and later winning the test series 1-0 will give lots of satisfaction to the Indian captain. There were some great individual performances from Ghambir, Zaheer and Harbajan. Sachin, Dravid and Laxman also batted brilliantly and gave consistent performances throughout the tour. Dhoni’s captaincy throughout the tour was excellent and aggressive. All in all a fantastic performance and a great win by Team India.